How many times have you thought about stocking up on rock salt or ice melt before the winter starts or even after it starts? This is the perfect guide to making a decision on the purchase. People make the assumption that “ice melt” is an umbrella term for any product used to melt ice, we are often asked by our customers about the differences between rock salt and ice melt. After working with thousands of homeowners and businesses during or decade in the business we’ve learned the ins and outs of the rock salt and ice melt world. For years, Halite (commonly referred to as rock salt) has been the “go to” material for melting ice throughout the winter. This effective material is the mineral form of sodium chloride. Rock salt works by penetrating icy surfaces and forming a solution of salt and water known as a brine. Because brine has a lower freezing point than water, the ice will begin to melt, and will be prevented from forming again in the future, so long as ample rock salt is present. Rock salt usually contains grit and other bits of gravel that are meant to help gain traction whether it is on a roadway, walkway, driveway or stairs. That is where the word rock in rock salt comes from. Rock salt is one of the most affordable methods for melting ice. 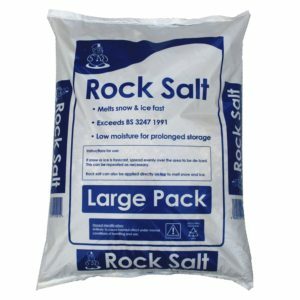 Except in times of extreme shortages, rock salt is also widely available, making it easy for home and business owners alike to locate and purchase the material when they need it. Rock salt will effectively keep surfaces free of ice in temperatures down to 25 degrees Fahrenheit, 7 degrees lower than the freezing point. Although most people are familiar with rock salt and its effectiveness at lowering the freezing point of water, many don’t realize that other considerations should be made prior to its use. First, rock salt can cause harm to plant life. If the surface that you’re planning to coat with rock salt is located near highly vegetated areas, you may want to consider an environmentally and plant-safe alternative. Pet owners should also be aware that rock salt can be dangerous when animals are exposed to it. Should rock salt become stuck between the pads of a dog or cat’s paws, it could cause burning and irritation, and if ingested could lead to gastrointestinal issues. Seek out a pet-friendly de-icer to avoid problems like these. Finally, if the temperature is supposed to be below 25 degrees Fahrenheit, rock salt will not work. There are a number of different varieties of ice melt but they’re primarily comprised of calcium chloride, magnesium chloride, sodium chloride and potassium chloride. Of these, calcium chloride is generally accepted as the most effective. Many ice melting products – especially those varieties which include calcium chloride – can lower the freezing temperature of ice in extremely cold temperatures. You may find products that are able to work down to -25 degrees Fahrenheit. This is because many ice melts are engineered not only to form a brine, but also to generate heat chemically. This not only makes the product more effective, but also faster acting. In addition to this, you’ll find many types of ice melts, all of which serve distinct purposes. Some are environmentally friendly, some are designed to be safe for children, some have been approved as pet-friendly, and some that do all three. It’s important to use care when purchasing ice melting products. 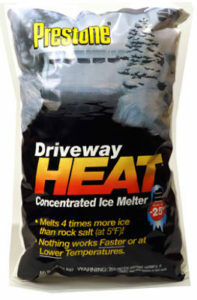 Just because a bag of ice melt features a picture of a child playing with a puppy on the front doesn’t necessarily guarantee that it is safe for children or pets. Be sure to read the labels before making a purchase. In order to be truly pet-friendly, ice melt must be coated with Calcium Magnesium Acetate (CMA). Home and business owners with special considerations for plants, children and pets, on the other hand, should take a look at ice melters designed to address these needs. Be sure to also take your local climate under consideration when making your selection. Should you have any doubt in your mind, be sure to speak with an expert about what product is right for your property.